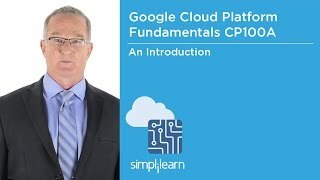 The Simplilearn Google Cloud Platform Fundamentals (CP100A) certification training course will give you a thorough introduction to the rapidly growing Google Cloud domain and show you how to incorporate cloud-based solutions into your business strategies. You’ll get hands-on experience deploying application environments to Google App, Container and Compute Engines. Take this first step to establishing your Google Cloud Platform credentials today. This Google Cloud Platform Fundamentals (CP100A) certification training course is designed to establish your expertise with Google Cloud Platform products and services and make you job-ready for the rapidly growing cloud services market. Through instructor-led online classrooms, live demonstrations, and hands-on labs, you’ll learn how to build, test and deploy applications to the Google Cloud Platform and incorporate cloud-based solutions into your company’s business strategies. This course will also prepare you for taking the Google Cloud Platform for Systems Operations Professionals (CPO200) training course. There are no official prerequisites for the Google Cloud Platform training course but participants should be familiar with application development, Linux operating systems, systems operations and data analytics/machine learning. Having this prior knowledge will be helpful in understanding the technologies covered in this course. This course was excellent in its technical explanations and comprehensive literature. I found myself locked and focused and ready for more learning. The course was great. Very informative. The trainer was very good, the training has a very practical approach with just enough information to not make it too overwhelming. The knowledge of the trainer, the breadth of the topics covered, the labs, are valuable to refer to again -- what I would like to see is a separate download availability of the slides used during the course. They were very well done and would be a valuable resource. The trainer's knowledge on the subject was impressive. The breadth of the topics covered, the labs -- will be valuable to refer to again. The training was conducted well, very well done, and to be able to refer to the slides is a valuable resource. Awesome and great training. The trainer imparted valuable knowledge. Good material and reasonable labs for someone new to GCP. Overall, I'd recommend the course to someone new to GCP to get an overall understanding and a feeling of GCP through hands-on lab exercise. Timed access to materials, ability to enroll in batch of choice after signing up for training, professional attitude of training and support staff and pace of delivery. Extended content access, flexibility on batch selection, professional delivery, promptness in delivery of batch content. LVC mode is very interesting and effective.